Why do we fix some goals in our life? We fix our goals to ascertain our pleasures. Whenever we fix some goal to achieve, we need to be 100% devoted to the vision of what we desire, completely honest with ourselves about why we want it, and understand what it’s actually going to give us once we get it. For that, we must have a deep sense of self worth and integrity within ourselves that we deserve to have this dream. Once we make ourselves crystal clear on these aspects, we may perhaps not like to make any excuse(s) but can easily step over them and start having real fun visualizing everything we want in our lives. Why do we not have everything our heart desires in life? It is because we have bought into some excuse about why we cannot have it. We procrastinate, hesitate and avoid taking inspired actions because we believe we don’t have the confidence, time, energy or power to make it happen.The real reason why we are stuck in excuse-ville, is because we are not fully in touch with our deepest pain and greatest joy around the desire we wish to visualize. If you deeply study some people who might have not succeeded in their tasks, you will find one thing everyone may have in common will be that they are so extremely creative about their story of stuckness. They will say that they had been stuck due to so and so reason. Their list of reasons for why they could not achieve their dream life may be more emotionally powerful than their joy for making something new happen. Their excuses, you may find, are filled with fear, drama and always on repeat. The more they may tell everyone in their life about what was blocking them, why they felt stuck, the more they may complain about how hard it was to get unstuck. They simply couldn’t see how this repetitive broken excuse record was creating their negative brain chemistry, and making it more challenging to think creatively about a positive future. Who we truly are is the light of pure spirit, an unlimited radiant awareness, the infinite source of divine consciousness, which cannot be defined by anything you can write on a piece of paper. Every excuse you have created is a limiting belief you’ve placed on top of and clouded this divine light. In fact, any positive or negative belief we cling to only implies that who we are is something limited, and not unlimited. Any belief you entertain that is disconnected from the truth that we are infinite souls who never die, is going to block your energy and needs to be recognized as some form of fabrication of the greater Truth. Excuses only have power over us when we give them power. If we believe something is true, then it becomes our living breathing reality on every dimension. The mind is such a limiting thing yet so extremely powerful. It is like placing a finger over your eye, it can block out the entire world of possibilities and options. The reason why we are not living our dream life everyday, is because we’ve given our excuses more energy, power and credibility than our joy for manifesting our dream life. It’s that simple. Our excuses hypnotize the mind to continue to believe we will remain broke, struggling in our relationships, energetically tired, emotionally empty, and feeling powerless about our lives. To step out of our excuses, we must embrace the fear of change. We must stop forgetting that we are infinite spiritual beings who will live forever. We must become aware that we cannot cling to anything in this world, because everything is always changing. We must wake up and hold on to the Real which does not change. That which is Real (Spirit) brings us deep peace, joy and contentment to our heart and soul. The controlling ego would somehow rather remain stuck in a comfortable old miserable habit, continue being lazy and settling for less. Don’t let your lazy ego destroy your life! Take the risk to try something different, explore something new, and decide to manifest your ultimate dream. Remember, an excuse is a proclamation of their lack of power. If you too have an excuse for your past failure, you must drop it! Review the whole past working and fill that empty hole with a curiosity, courage and decision to create any reality you want. By holding onto your excuses, you create more difficulty in awakening the magnet within you! Ramana Maharshi says that you are the constant illumination that lights up both the experiences and the void. 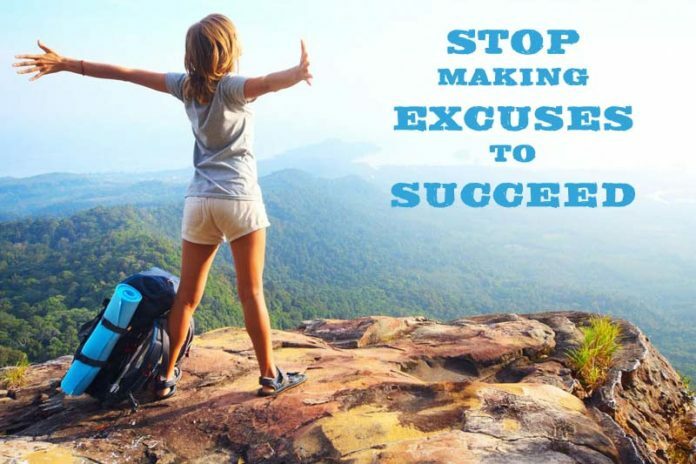 To achieve something, you need to be free of your habit of searching out excuses for your likely failures. You may have to ascertain that you focusing on what you want, or what you don’t want. Are you thinking positive thoughts and choosing to engage in more positive feelings, or are you choosing to stay in those old comfortable negative thoughts, feelings and stories about you? When it comes down to truly being free from all your excuses, there is only one thing you need to be vigilant about in each moment. The thoughts we think become the chemical building blocks in our brain, which either cause us to fall down into the muck or climb up to reach the stars. If you would choose to think only one thousand positive thoughts in a row for the next 24 hours, this would instigate a new chemical foundation in your brain that would make it 100 times easier to manifest the life of your dreams for the rest of this year. Just, keep posters highlighting your aims in your room, at your table or at that place where you may be able to see very frequently. This may strengthen your brain chemistry. It plays a vital role in shaping your future and your strategy as well. Another necessary factor in creating positive brain chemistry is having an appropriate diet as be suitable to your taste and physical requirement and a little exercise you may be able to undertake to keep yourself physically fit. These essential habits shift your brain so deeply that they will not allow your mind to entertain doubts, fears or excuses for very long. When these core disciplines become the foundation of your life for 90 days in a row, you will feel like you could visualize golden castles in the sky. By rising above your most wonderful excuses stopping you from taking on these magical disciplines, you will form the most powerful energetic foundation to accomplish any dream your heart desires. If you want to radically transform your life, start feeling super creative, deeply inspired, spiritually enlightened, emotionally empowered, financially abundant and totally free, there’s one simple thing you’ll want to do. Make the choice to drop your excuses and integrate these core disciplines into your life. The daily practice of 20 minutes of physical exercise and eating appropriate diet all day long for 90 days will transform you completely. This is pure self care that will uplift your energy and consciousness, which dramatically increases your ability to visualize anything you want. We understand that pain and joy are two of the most powerful motivators we have. When we feel our highest emotional joy, life gets really juicy. Similarly, the greatest pain affects us. Our pain pushes us to step out of our velvet rut to make radical changes happen, and our joy, excitement and passion for our life initiates that creative fire to give birth to something new. If we can hide or win over all the pain inside us, we will see there is nothing left to fear, and awaken from any excuse that makes us feel small, stuck and powerless. A real deep contentment inside our soul is discovered when the feelings of these opposing (yet complimentary) energies are brought to the surface to be felt, seen and heard. “Pain and joy are inevitable, yet suffering is optional.” ~Reverend Michael Beckwith. You know excessive pain and joy, both conditions can affect us terribly at some point of time. Someone may not be able to bear and can die – it depends upon that’s individual power to tolerate. Our emotions and feelings are the fuel that skyrocket us into visualizing the life of our dreams. Yet, when it comes to the steering wheel to reach our destination, we must have impeccable integrity with our word. This simply means that we consistently do what we say we are going to do, and say what we will do. When we announce that “I am going to do this on this day” and follow through with it, we form a more trustworthy bond within our own being. This creates an energetic root in the physical world that makes it easier to magnetize more dreams in the future. When your word is based in a solid sense of honesty and integrity towards yourself, the circumstances tend to create environment to make your dreams visible. When you’re 100% impeccable with your word, amazing things just apparent out of the blue! Integrity with yourself means you have integrity with your environment. You will be able to search out new avenues if you do not succeed in any one of your attempts. Everyone can feel the level of self-trust you are living at, and will interact with you based on this vibration. When the trust in yourself is at its maximum, life feels amazing! You know you’re on the right path and that nothing can stop you.